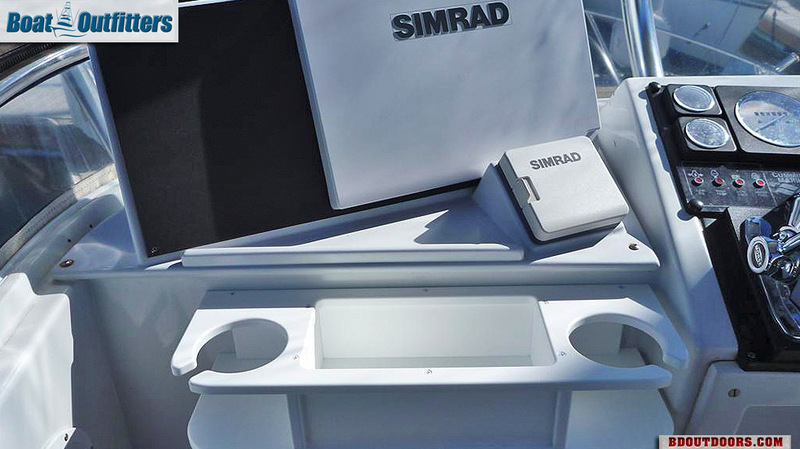 Maximizing every inch of storage space on your sportfishing boat plays a key role when trying to create a safe, clean fishing platform. 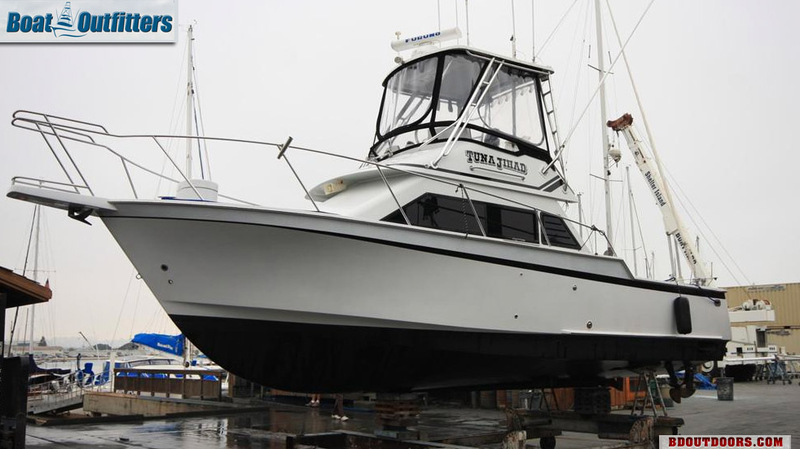 Last year we purchased a 31-foot Innovator sport-fisher. 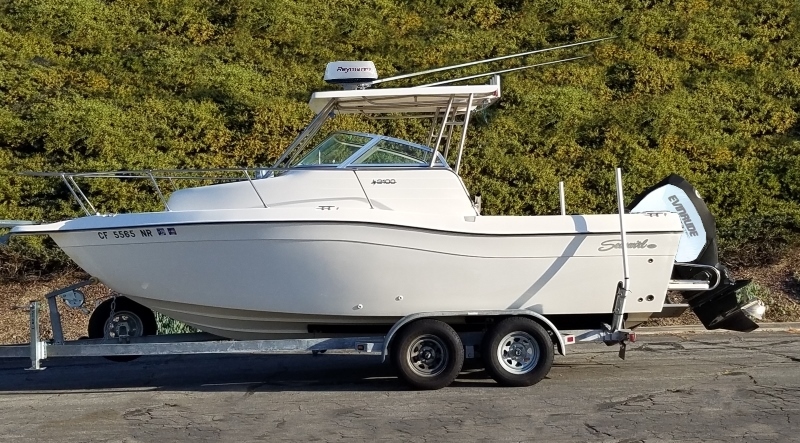 While this boat was a huge step up for us in terms of size, it’s a relatively small boat and it offers zero dedicated tackle storage. We needed more storage space for gear. 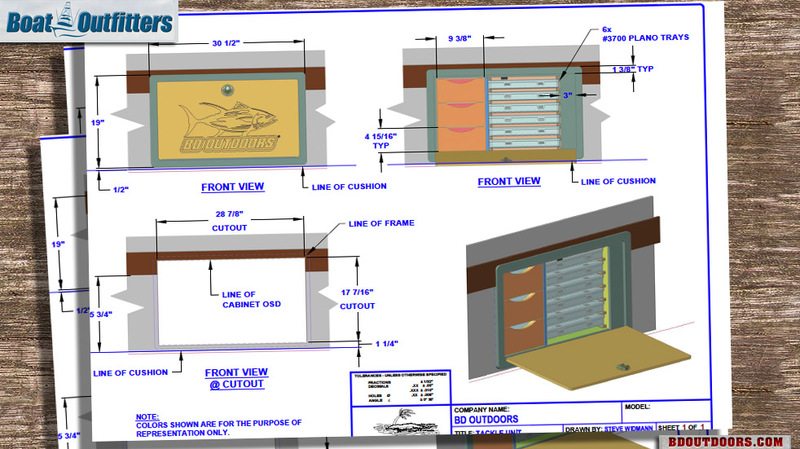 A buddy told me about Boat Outfitters, which specializes in building tackle storage systems, and after checking out their website I was sold. They offer tons of pre-built options as well as custom-made solutions. 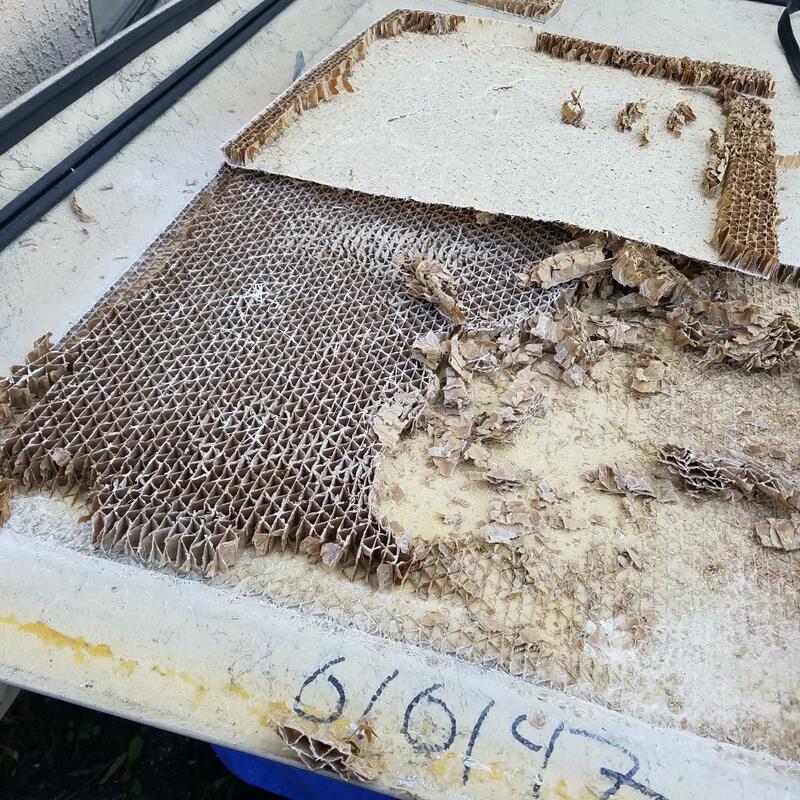 As Andrew and I went back and forth on the designs, he invited BD editor Charlie Levine to go by their Florida facility for a behind-the-scenes look at how all these products are made. 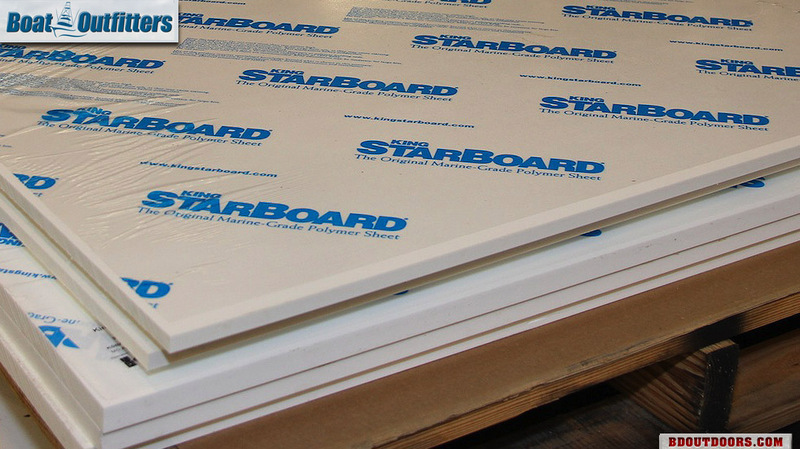 Boat Outfitters is the largest consumer of King StarBoard in the world! 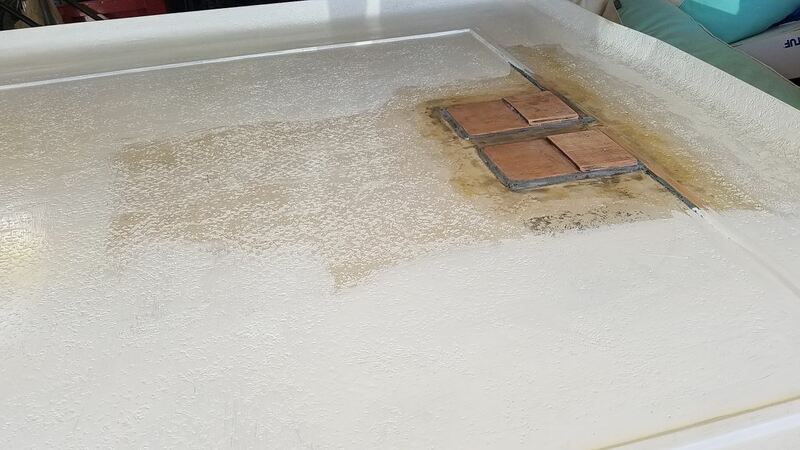 The company uses this strong, easy-to-maintain, mildew-resistant material to build custom tackle centers, hatches, boxes and all sorts of other useful products for your boat. 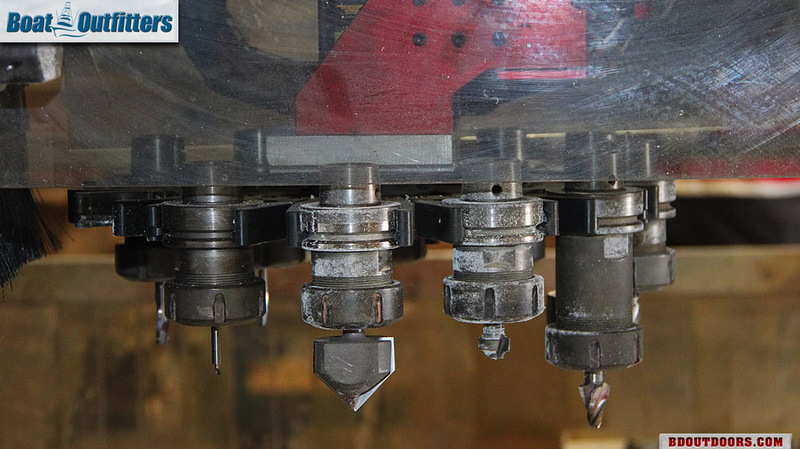 This is one of eight custom CNC routers that Boat Outfitters uses to make the cuts for the custom tackle centers. 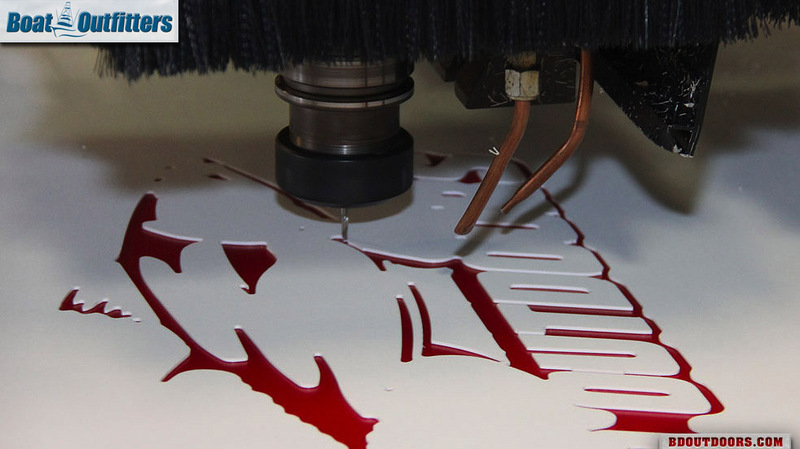 The machine is computer controlled and the cuts come out flawless. 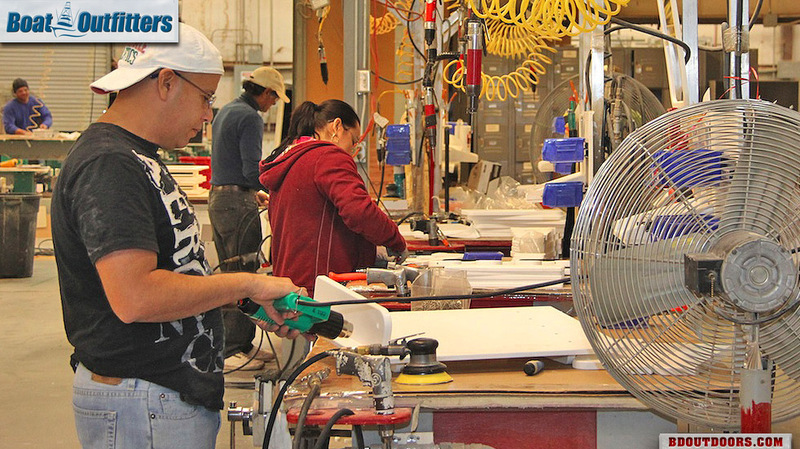 After the sheets of StarBoard are cut to size, they get moved down to an assembly area where workers in the Florida facility begin to put the products together. The logo begins to take shape. The ColorCore features a colored piece of StarBoard sandwiched in between two white pieces, so you end up with a very sharp design. 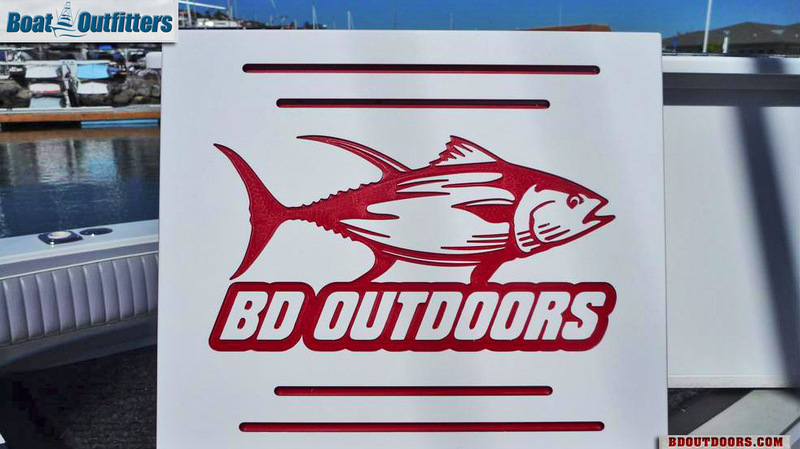 The boys at Boat Outfitters created these BD logo samples on some scrap pieces. 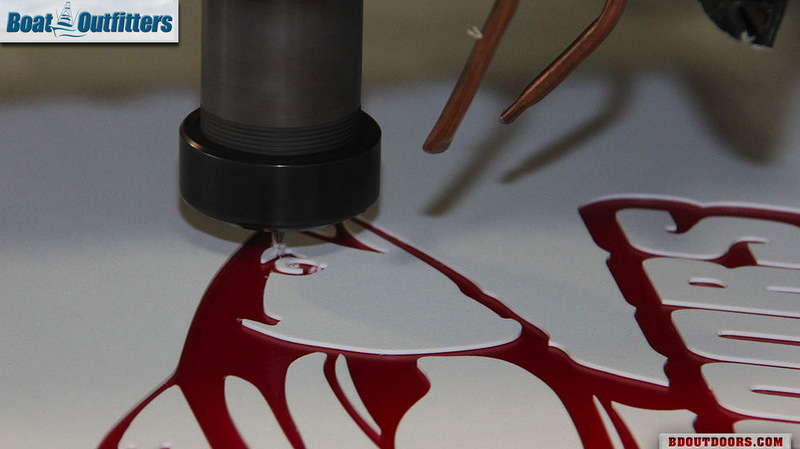 They wanted to make sure the BD logo would come out sharp before beginning the final piece. 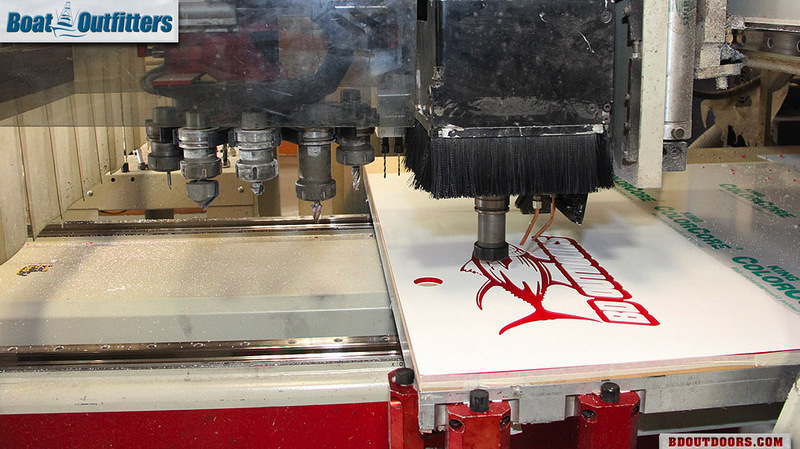 The CNC machine features 12 cutting tools and 20 different drill bits that it switches between automatically to make quick work of the logo cutout. It’s pretty cool to watch the machine go to town. The detail is impressive. 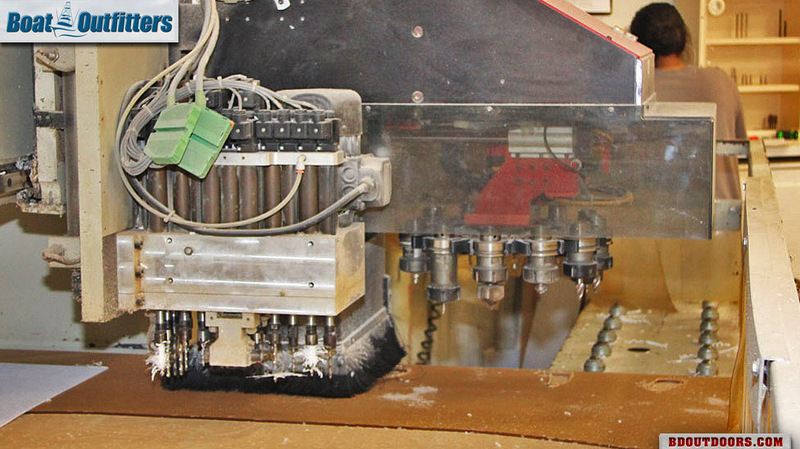 As the machine cuts, it blows out the shavings to keep everything nice and clean. It only takes one man to operate the machine. Once all of the dimensions are programmed in, just stand back and watch the router do its thing. 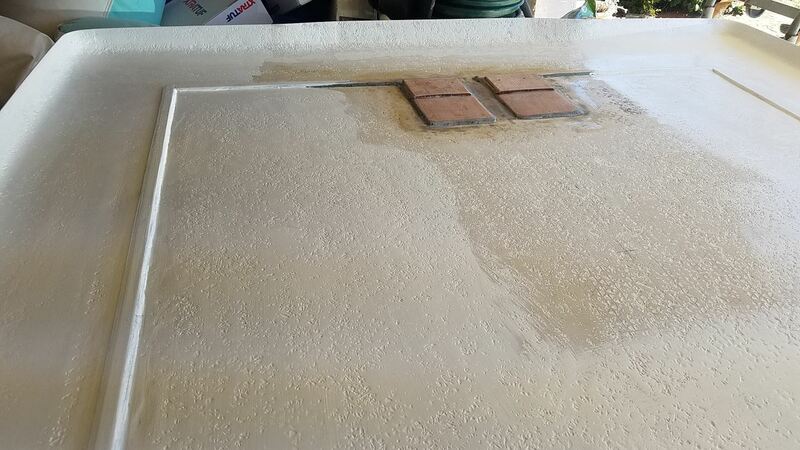 After the router is done with its cuts, the building process begins. Boat Outfitters is a family owned business that’s been doing this for decades. The entire process operates like a well-oiled machine. 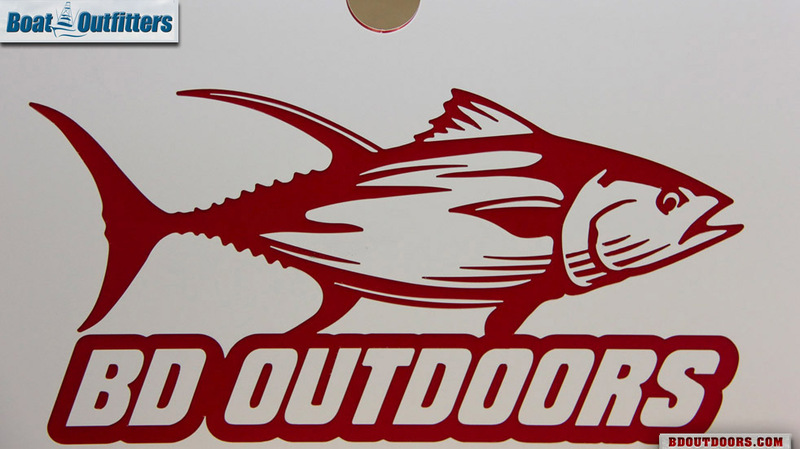 We couldn’t be happier with the final look and the detail that Boat Outfitters got into the logo featured on the front hatch for the new custom tackle locker. 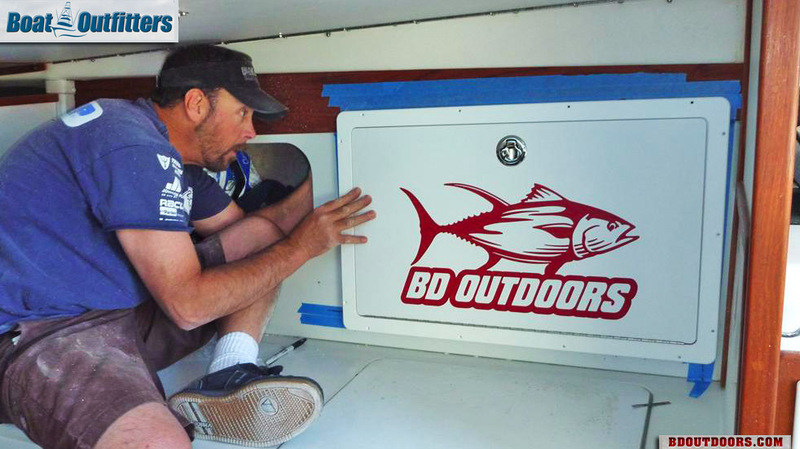 Here’s a quick video of one of the CNC machines cutting out the BD logo for the door of our new tackle center. 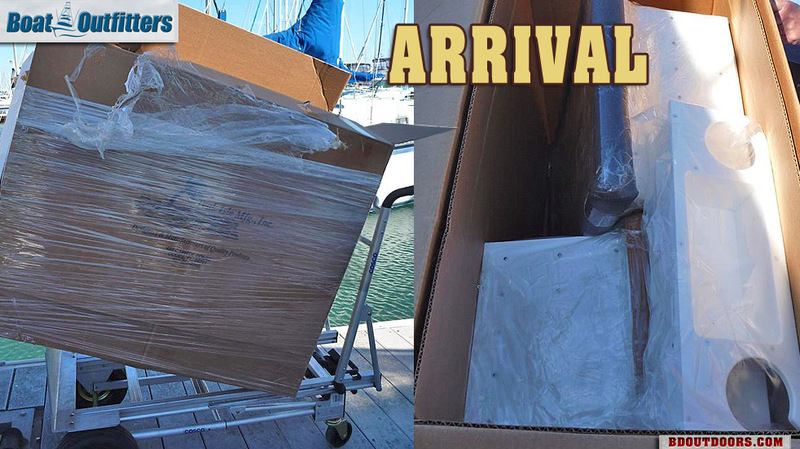 About two weeks later we received a couple of massive boxes of goodness! The first thing that jumped out at me was how well Boat Outfitters packaged everything. No chance of shipping damage here. We loaded everything up and rolled down to the boat. 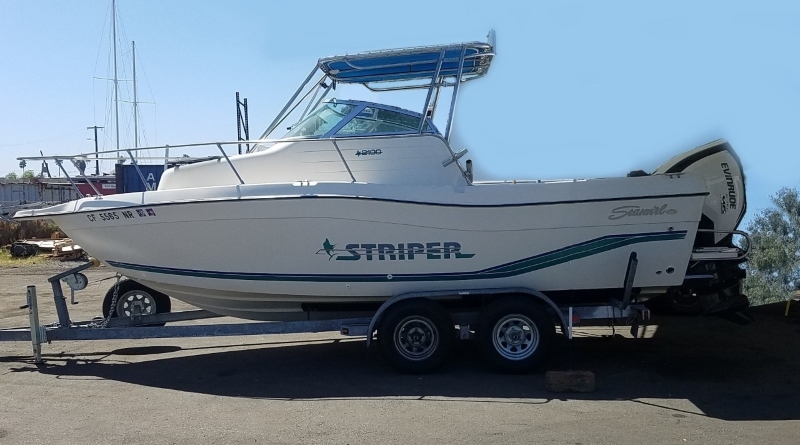 We settled on four custom pieces for our boat. 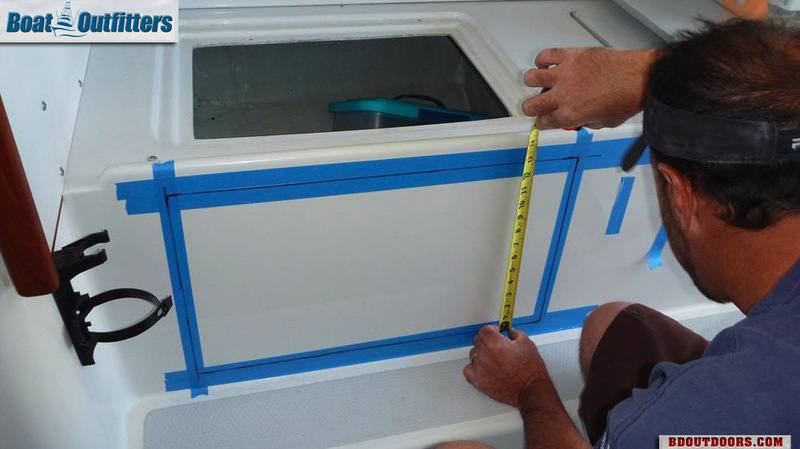 The main piece is a custom tackle station with drawers to fit in the starboard cabin wall. 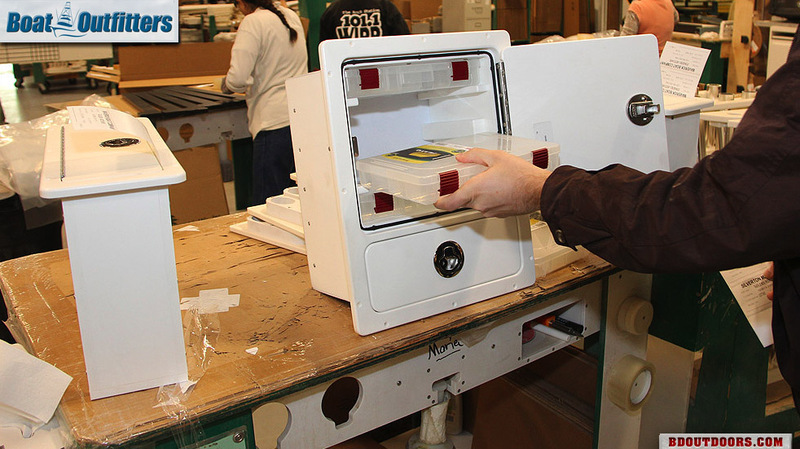 The second features four Plano 3700 storage trays with a pocket on the side for loose stuff. 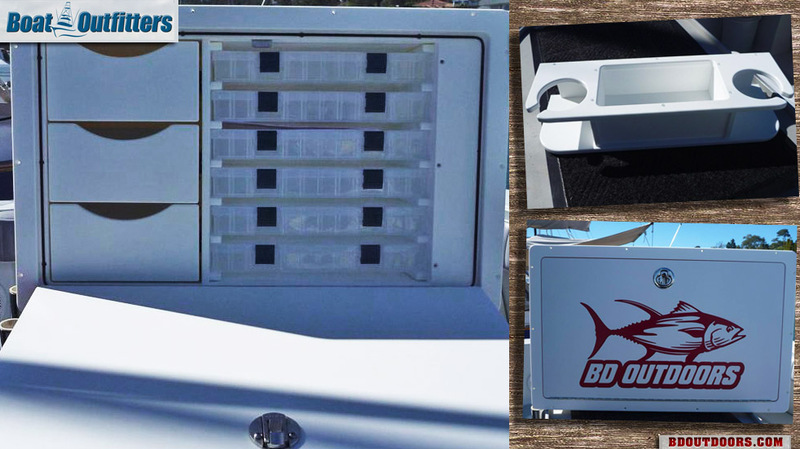 Third is a custom anchor locker door featuring the BD logo and the final piece is a custom Gyro binocular rack with cup holders. 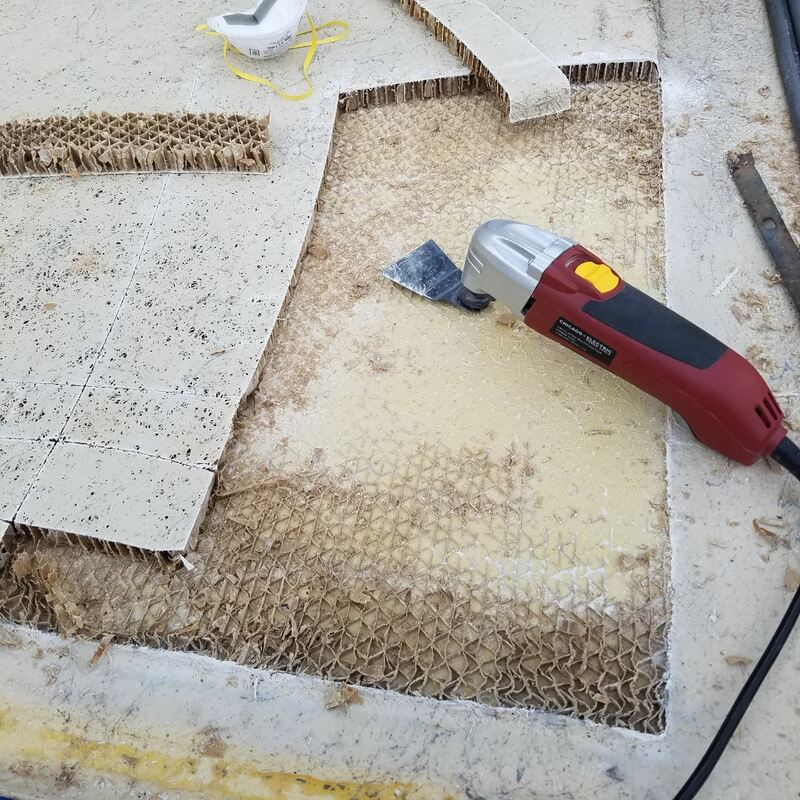 The installation should be pretty straightforward for most, but in our situation we had a couple tricky cuts where the teak trim met the fiberglass. We decided to bring in a pro to help out. 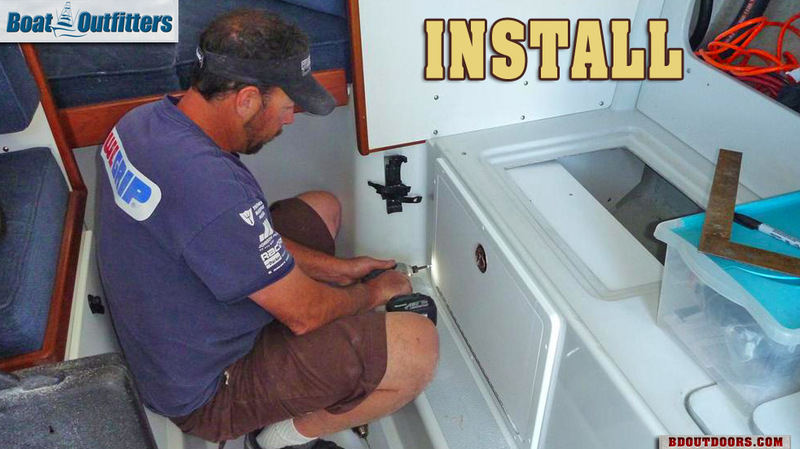 Mark at Monsoon Yacht Service (619-405-2176) met us at the boat and went to work on the smaller tackle holder in the bench seat. After about 20 minutes, the new part was installed and good to go! Mark turned his focus to the big tackle center. This part is a monster, measuring almost three feet wide and weighing 60-plus pounds! About 30 minutes later we put in the last screws. While Mark was cutting the holes for the big projects, I stepped away to install the new anchor locker door. It came out awesome and ads a really cool custom touch to the boat. I also took advantage of a few more minutes of down time and installed the custom holder for the Gyro binoculars. Installation was a snap and it turned out great. Overall, we could not be happier with the finished product. 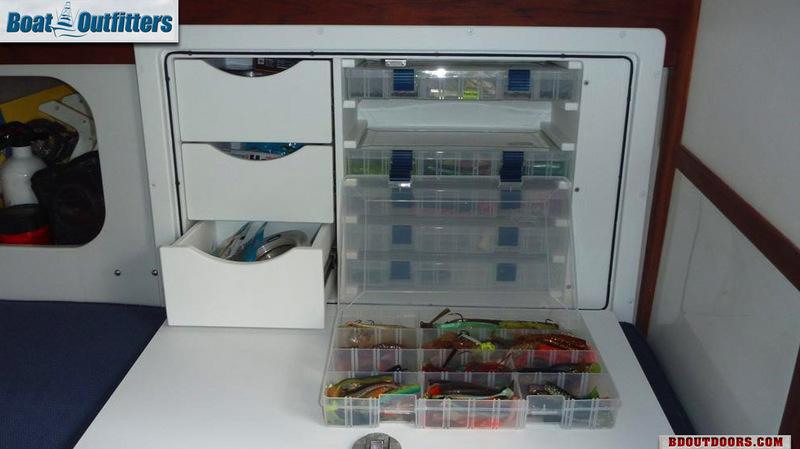 We can now store all of our tackle in a clean, logical order. The units look sharp and factory installed. 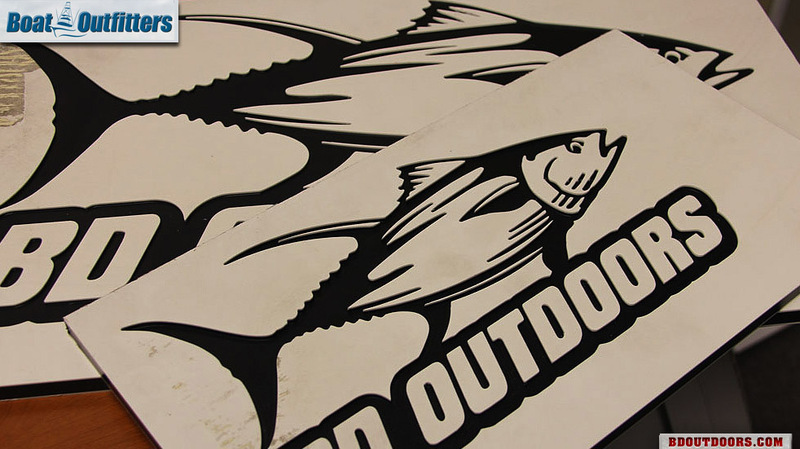 The best part is we now have tons of free space in our old tackle locations for more gear! 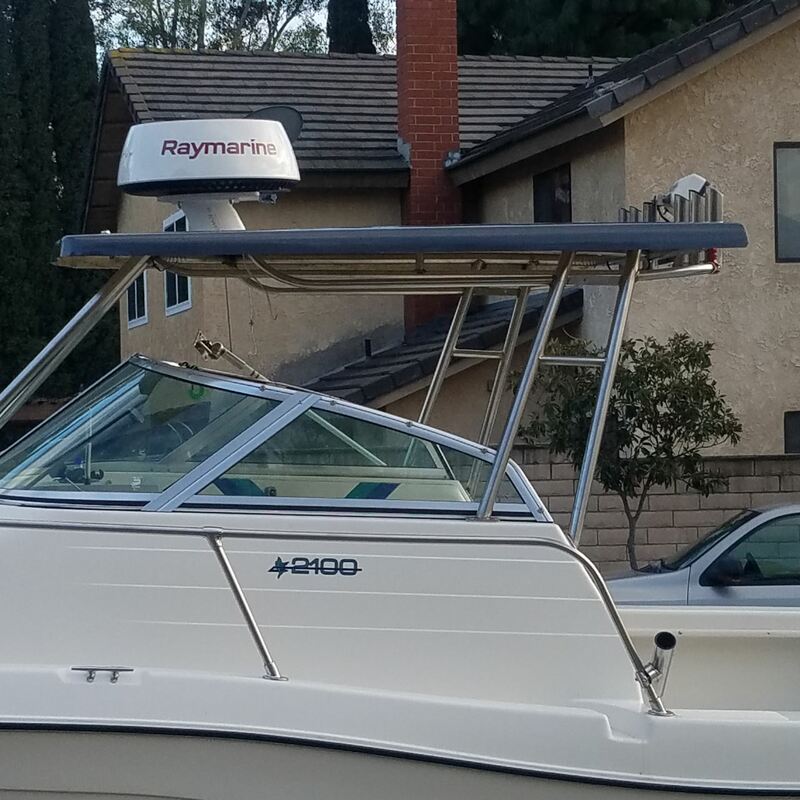 We owe a big thanks to Boat Outfitters (www.boatoutfitters.com) and Monsoon Yacht Service (619-405-2176). 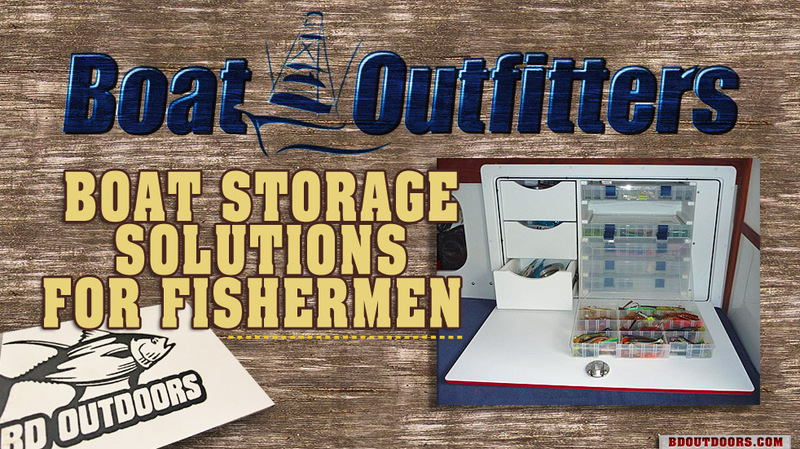 Boat Outfitters specializes in making tackle boxes, hatches, organizers and just about anything else you could need on your boat. 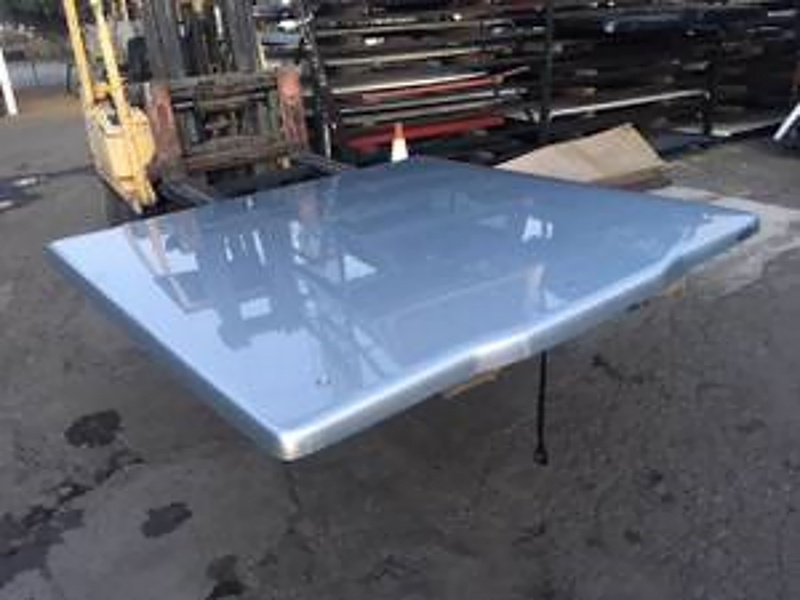 If they don’t have exactly what you are looking for, they will custom build it for you. 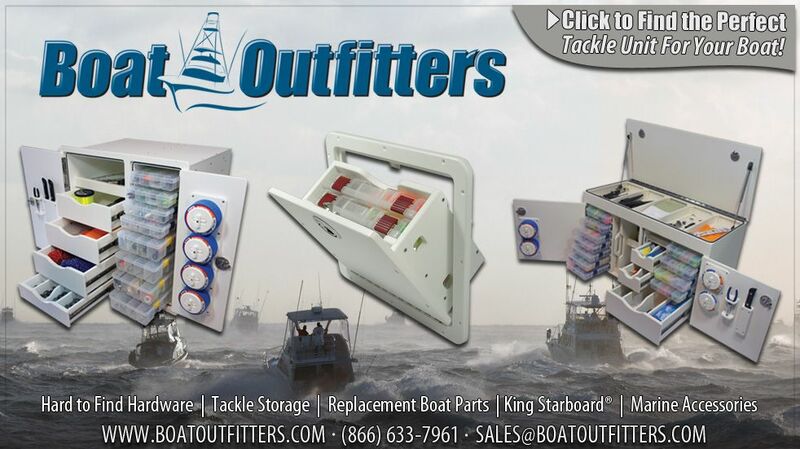 To see the company’s entire line of products visit www.boatoutfitters.com. Melton's International Tackle has come up with lots of great gift ideas for the fishermen on your list.